Home » Collections & Research » Museum Collections » George Hoshida Collection » 6-14-42, 9:30 PM. 2 drawings on paper, laminated (1 sheet) : ink ; top image 4 x 5 in., bottom image 3.875 x 5 in., on sheet 9.5 x 6 in. 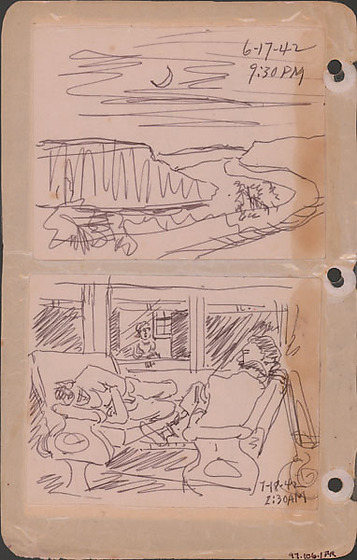 Ink sketches of night landscape on June 17, 1942 and train interior on July 18, 1942. Top rough sketch depicts a winding road or river around mountains under a sliver of a moon. Sketch is on a small sheet glued to larger sheet. Bottom sketch of three men on facing benches in a train car and a woman visible through the window. Man on left is lying down on his side with arms crossed and legs bent, while on other bench one man sits with head bent and back to viewer and third man is partially visible sitting in profile facing left. In the background, a woman is framed by middle window of train as she looks out of window. Sketch is on a small sheet glued to larger sheet. Drawing 97.106.1FQ on recto of same sheet. Written in black ink on top image: 6-14-42 / 9:30 PM. Written in black ink on bottom image: 7-18-42 / 2:30 AM.